Can Tho (VNA) – Vietnamese Deputy Prime Minister Trinh Dinh Dung has called on member economies of the Asia-Pacific Economic Cooperation (APEC) forum to cooperate and support each other in building and developing sustainable and green agriculture adaptable to climate change. The APEC economies should innovate technologies in agricultural production in order to ensure food and nutrition security, the Deputy PM said at the High-Level Policy Dialogue on Enhancing Food Security and Sustainable Agriculture in Response to Climate Change in the Mekong Delta city of Can Tho on August 25. Differences in production ability, human resources and high-tech remain barriers to regional development, requiring the APEC members to step up their cooperation and seek the best measures to reach sustainable and green agriculture, he said. Deputy PM Dung highlighted the need to intensify scientific and technological research and transfer in agriculture, forestry and fishery sectors to increase productivity as well as product quality, while promoting technological applications in agricultural management. The APEC members should enhance cooperation in researching food and nutrition security, and reducing food losses, he stressed. The Deputy PM proposed facilitating the development of an equal consumption market on the basis of multi-lateral trade principles and agreements, considering trade activities an important factor promoting sustainable agriculture towards food and nutrition security. Along with exchanging information about sustainable management of natural resources, including cross-border water resources, it is necessary for the economies to boost rural-urban development with stronger connection to remote areas. The role of the community and the business circle should be brought into full play through the public-private partnership (PPP) model in investment in infrastructure, transport, telecommunications and internet, particularly in disadvantaged areas, the Deputy PM said. 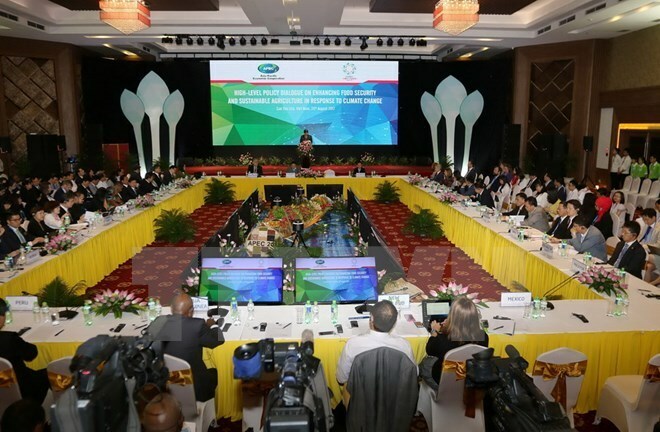 The APEC should set up connectivity with regional programmes like these of the Association of Southeast Asian Nations (ASEAN) and Mekong Delta Sub-region programmes, he noted. Deputy PM Dung called for greater joint efforts to implement the APEC Disaster Reduction Risk Framework, build a disaster prevention system, and improve post-disaster sustainability and restoration ability, with attention paid to community-based disaster risk management, sustainable rural development and ensuring legitimate rights of coastal residents. How to ensure food security and sustainable agriculture in response to climate change is one of the most pressing issues facing not only Vietnam but Asia-Pacific and the world at large, he stressed. Applauding the High-Level Policy Dialogue, the Deputy PM said the event will contribute to the global efforts to complete the UN Sustainable Development Goals by 2030 and the Paris Agreement on Climate Change as well as food security measures approved by ministers of the APEC economies. The Vietnamese Government has paid heed to cooperation within the framework of the APEC and pledged to stand ready to coordinate with other APEC member economies and developing partners to ensure food security, for peace, stability, sustainable development and prosperity in the region, he noted. Earlier, in his opening remarks, Minister of Natural Resources and Environment Tran Hong Ha said climate change is one of the greatest challenges to mankind in the 21st century, which has had serious impacts on agricultural production and the livelihood of the global population, particularly in the Asia-Pacific region. “The situation will be exacerbated unless we have more effective and robust response measures backed up by a comprehensive cooperation with the international community in general and the APEC region in particular,” he said. As one of the world’s leading food export regions with the highest agricultural production field, the APEC region covers a huge geographical area with high population proportion, which tends to increase. Thus, Vietnam selected and proposed “Enhancing food security and sustainable agriculture in response to climate change” as one of the four cooperation priorities of APEC 2017, the minister said. This High-Level Policy Dialogue offers a great opportunity for high-ranking leaders responsible for food and agricultural production in the APEC member economies to strengthen and deepen their comprehensive cooperation towards sustainable and climate smart agriculture and food loss management while contributing to ensuring food security in Asia-Pacific, he noted. Alan Bollard, Executive Director of the APEC Secretariat, said Vietnam, this year, has three important priorities on sustainable growth, regional economic integration, and small and small business modernisation, along with food security and sustainable agriculture in the context of climate change. Delegates at the dialogue looked into food security in a changing environment, innovation, technology and applied research, and the public-private partnership (PPP) in enhancing sustainable agricultural investment.